a few pictures of my brother, ross, and his son, corbin. i thought corbie looked cute. w showing off the cuts/stitches and black eye he got from having a scooter accident. we took him into the er, and he got three stitches. given that he had blood all over his head, and he said that his shoulder hurt, we felt very grateful that it wasn't worse. ok, now here is our trip down south. we went down with our friend emron and his son moses to torrey and the boulder mountain. our first stop in torrey was to look at a piece of property for sale. we poked around the 3 acre property. the "house" was in bad shape. and there was quite a bit of junk around. but there was also a stream/canal, which obviously we were attracted to. we drove about a mile down the road to hit our favorite burger place--slacker's. we got there just before it was closing. w found some kiddie playland-type toys. we all enjoyed our burgers and fries. delish! after dinner, we headed over to the flue shop motel and stayed in the same big, family-size room. before we went to bed, though, we bought a few treasures at the shop. w used his money to buy a beautiful fox skin, look at that tail! definitely bigger than any fish we've ever caught. moses liked the fox fur too. at the flute shop, moses got a arrowhead tied to a piece of wood. moses liked wearing this around his neck. b brought his special batik celana pendek to sleep in. wah! the sunrise the next morning was beautiful. we went to a big lake to start off with. we had heard the fishing was fast. sadly, it didn't end up that way. w caught a nice trout right in the planty area off the shore. when he cast it out, i thought "oh man, he's not going to get anything there. we'll only end up losing a lure." i guess you just never know. w was so happy to catch this one (as it turned out, it was the best catch of the day). some beautiful and rugged pictures on the mountain. we did some off-trail bush-whacking type hiking, which was fun. it was a little reminiscent of our crow trip in 2012. the scenery looked about the same, but we weren't carrying 30 pound packs! i was hopeful we'd have another great fishing day (like b and i had had the weekend before), but it was a long, almost entirely fishless day. i did see a garter snake that b picked up, and w liked to play with. although we didn't catch many fish (emron did manage to catch a teeny-tiny one), we did make it off the mountain in time to eat at slacker's again! moses was so keen on eating there that it's good we made it out in time. we did have a lot of fun together even though we didn't catch any of those huge trout trolling around in the clear, clear water. 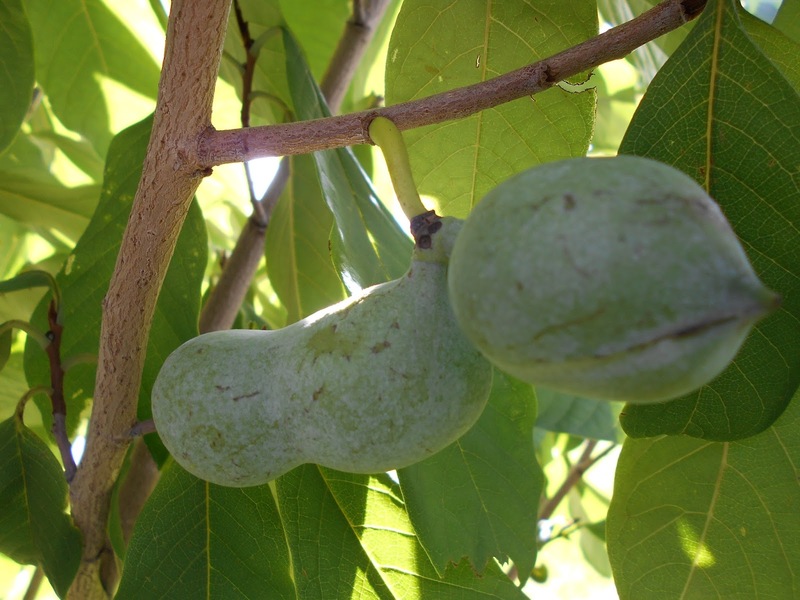 For an update on our pawpaw trees and other of our pawpaw activities, click here. b and i celebrated our 14th anniversary in may in jakarta. we gave each other nice gifts and we were together, but it was a stressful time. one of our gifts to each other was to go away for a weekend once we got back home. my mom agreed to watch w and s--so b and i went away to torrey and the aquarius plateau in south-central utah. we got down to torrey, friday night and had a nice burger dinner at slacker's and then headed up into the plateau. we were going to camp, but the sky looked rainy--so we looked around on the mountain and then came back down to find a motel. it was beautiful up on the mountain. it looked a bit like the smoky mountains in the waning light. b and i like how the flash illuminated the grass in the foreground. we found the flute shop motel right by the base of the plateau and stayed there. although i wasn't sure what it would be like (motels always seem a little psycho-like to me), it was lovely. the room was big and clean and warm. and the owner, vance, was delightful. he loves fishing, and he gave us some good tips. packing up our things to get ready for fishing. there's a teepee out front of the motel and flute shop. we made it up into the mountains fairly early and enjoyed the sunshine and beauty of it all. we even saw several acorn woodpeckers! i have long wanted to see acorn woodpeckers--so it was a real thrill. there were many of these bright yellow bushes. me looking up the acorn woodpeckers in our bird book. a cool pine tree. look at that bark! this gives you more of a sense of how big it was. as is common in this part of the state, there were cows. this one with the yellow forehead was b's favorite. fish creek stream ran along the road. you always have to love a clear stream. we parked the xty and walked up a steep road to get to the first lake-reservoir. we were greeted by an american dipper. b caught his first fish at this lake. a lovely fish. not too big, but it felt good to catch one. we made our way to the second lake/reservoir and started fishing. it was not fast fishing by any means, but i caught a fish! and a big one at that. we were very excited to have a good-size fish. b measuring it against his arm. i'm so excited, i'm winking! look at that reflection. this second lake was a pretty one. the color of the water was a cool shade of green. b likes to say that in this picture it looks like he's about to jump off the rock into the sky. we stayed at the second lake for awhile, but then decided to move on to a small, interior lake that was supposed to have fish. we back-woods hiked it to the third lake--honeymoon lake, which seemed appropriate given that it was our anniversary get-away. i liked these bright red berries. of course you wouldn't eat them, but they were pretty. and, to brian's surprise (or, really, un-surprise), they reminded me of oregon. honeymoon lake was really gorgeous. it's amazing how a place so far away from the uintas can look just like the uintas. we fished as we walked around the small lake. but within about 15 minutes, it started raining. and then it really started raining! b got under the shade of this tree faster than i did. i like these shots of the rain. i think these are our first mountain-rain shots. they do a good job of capturing the frantic rain storm we waited through. like the uintas, though, the rain storm didn't last long--the heavy part was only about 10 minutes. then it lightened up, and then it stopped all together. it lasted just long enough for us to decide we should put on our ponchos! the fishing was bad at honeymoon, so we went back to our second lake. we fished there for awhile (in the sun as you'll see), and then i caught it--the big one! i caught the absolute biggest fish of my life! the longest and the fattest and the most orange. it was really beautiful. a lovely tiger trout. with such a large mouth. it was so exciting. b and i had lost a couple big fish earlier in the day--but we had talked through how to reel in a big one so we were prepared for this one. i reeled it in, and b scooped it out of the water (head first) in our net. we made a great team! my two fish on the wooden stick we used as our stringer. then on the other side of the lake, i caught my third good-size fish! we had heard there were big fish up there, and we weren't disappointed. the only things that would have made it better is if b would have caught a big fish and the fishing were faster (we averaged about 1 fish/hour of fishing). here i am with my three big fish. wah--they were heavy. b cleaning our fish. he ended up catching 4 fish (3 of which we kept), and i caught 4. it was a lot of fish. this second lake, which gave us our three big fish and a few small ones was interesting in so many ways. one of them being that the water was very, very clear. and there were lots of big fish in it, and you would just see them cruising around in the water. oh man, it was hard to watch them sometimes. we felt happy to get three big fish (in fact, the three biggest fish of my life), but there were so many big fish in there. and most of them would just not bite. in fact, sometimes they would get scared when they'd see our lures go by. brother. on our way down the mountain, b got some more pictures of his favorite cow. b with the nice desert landscape in the background. the sky was a bit hazy. this was in the middle of the bad air quality we had for a few weeks with all of the wildfires in the west. we stopped at the flute shop on our way out. i got a cool turquoise ring, and we chatted with vance some. then on our way through torrey, we stopped at cafe diablo and had dinner. we shared a few small plates--rattlesnake cakes (i've wanted to try rattlesnake for a long time), empanadas, and goat cheese and tomato marmalade with crusty bread...it was all so good! an interesting thing about this restaurant was that there was a balinese mask in the bathroom. there were other masks too, but ironic to see a balinese mask in a southwestern-themed place. here, a face carved into the rock outside the front door. on our way back, we stopped at this old cop car to get a close-up of the man in the front seat. yikes! as we drove by the first time, i thought at first that it was a real man. as we got closer, i could see that it was a mannequin-type figure. but a really ugly one. looking at the it up very close on the way home proved that it was very ugly. we had a great time together. it was one of those trips that just seemed magical. we loved staying in the flute motel, our fishing was amazing. the food was great. we love my turquoise ring. we enjoyed talking together and hanging out. it was all great--definitely one of our best anniversaries (even if it was a few months late) ever.